I thought I would share a bit more about it. I knew I didn't want something heavy and formal that would change the feeling of the room. and bringing in the bouquet of Stock. Perfectly shabby sweet and edged all around in a double ruffle. and it's back to looking happy and fresh. 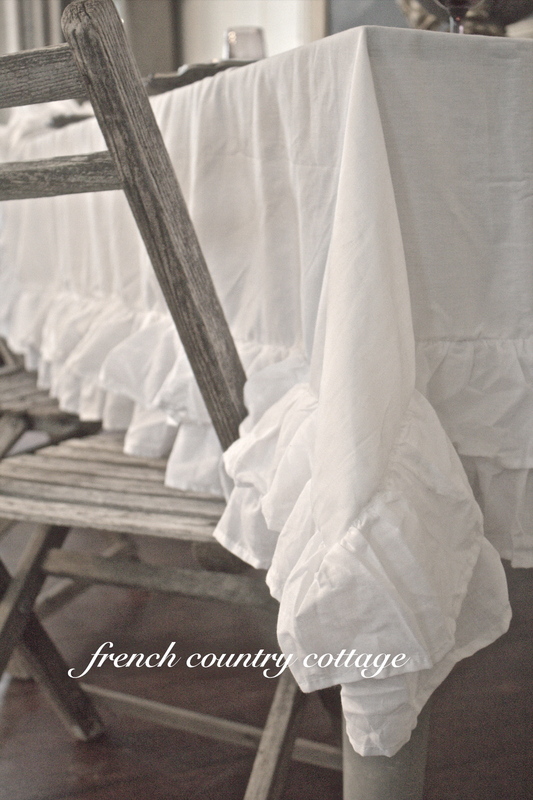 burlap tablecloths and ruffled linens that I make and share on my blog. but do have a few things spinning around in that category so stay tuned. We woke up to rain here yesterday and there is rain in the forecast almost every day this week. and maybe play a little catch up with blog visits. I have a fun Spring project coming up ~ a little something to do with our Feathered friends. Well Courtney, I think you would sell the heck out of your slipcovers and tablecloths if you offered them for sale. This is a sweet post to start my week. I love the pinks, grays, and whites. Love the curtain in the bath, too. Thanks for sharing all of your lovely soft ruffles and linens this morning. It's a wonderful way to wake up and start the day. Courtney, that is so pretty in every shot whether on the table or in the bathroom puddled on the floor. Just gorgeous. You did a fabulous job on the tablecloth and the shower curtain, Courtney! I just love anything with a ruffle and it is spilling over into my wardrobe now! Oh how I love white crisp linens, also! Girl, you are such a seamstress! Beautiful photos...and you have some incredible chairs! Really pretty! A very romantic post. I love the ruffles. Gorgeous! I'm right with you on crisp white linens...the more ruffles, the better! I love your style, my lovely. SO gorgeous and romanitc and pretty. Your house looks like such a warm haven. Perfect for snuggling when it's raining outside! Lovely, as usual....thanks for the Morning pick me up! Love this! 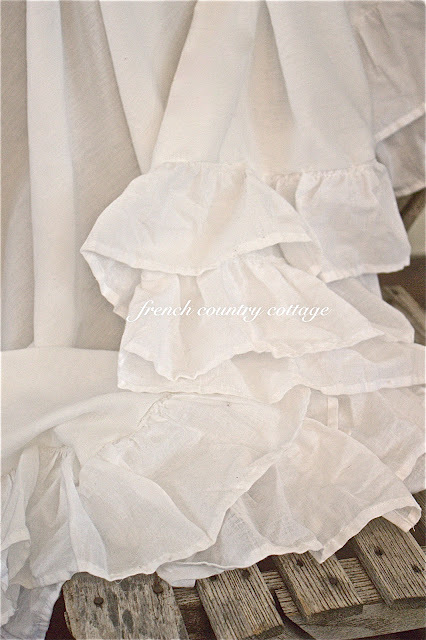 I am actually working on some ruffled edged tablecloths too! Yay, I love this look. Your table is BEEEEAUTIFUL! Can you tell us about your brown charger plates? I saw some like these a few years ago and loved them, but didn't purchase them. 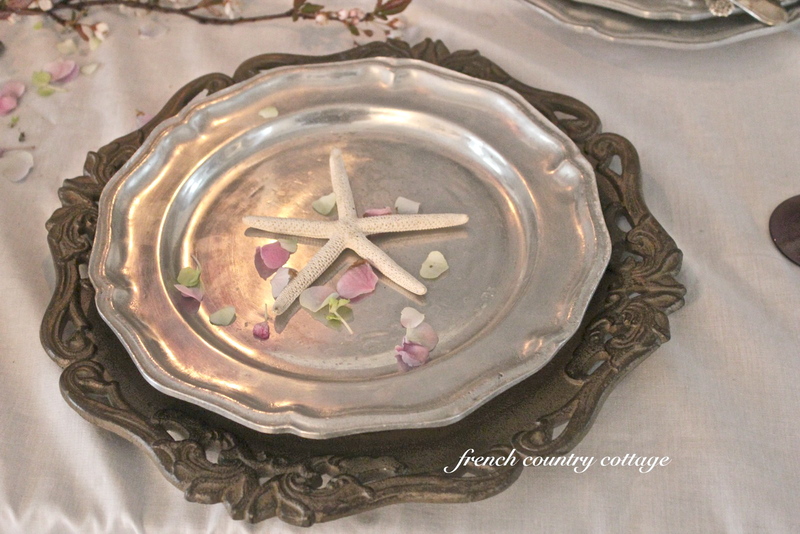 Are the plates on your table still available where you purchased them? They are a great accent for MANY things! I seem to find the time to "fluff", decorate, arrange, etc., for other people but I don't take the time to actually do it for my own home.This is inspiring me to make and follow through with plans for my guest room and living room! Love the ruffles - so pretty!! So romantic and beautiful....I want to sit there and drink champagne...in a pink glass...yes..
LOVE that table cloth.Looks perfect on that window.I love the softness of the ruffles. Ohhhh your ruffled tablecloth is delightful in every way. It would be pretty draped anywhere. I love the fabric you used, it's just right, light and airy, and so so pretty! Courtney I love everything you do. 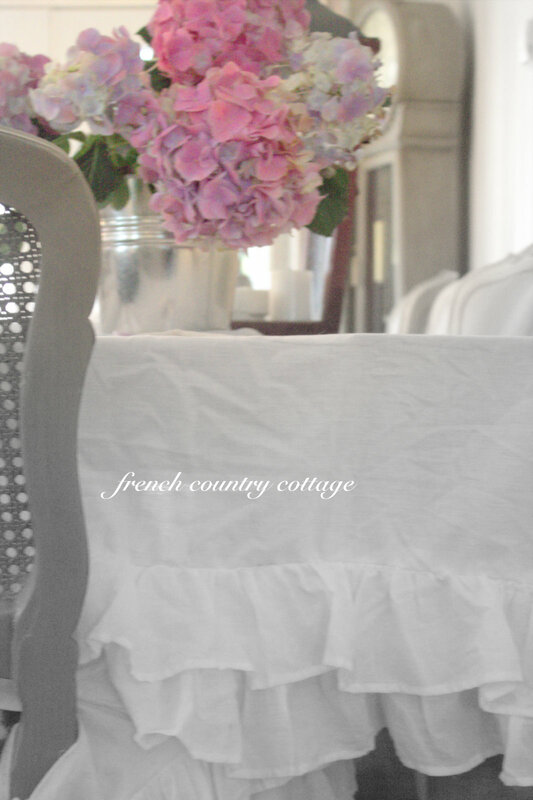 It always looks like a pretty French B&B... romantic and effortlessly elegant! I always feel white linens look so romantic and ruffles just top it all off. I love your table cloth and curtain. Every photo is lovely! Thanks for sharing... have a great week! I always get excited when I see you have done a post on something ruffly--I love what you did on your bathroom window. It looks perfect.Can't wait to see your spring project! You are quite talented and there is such a magical ambience of romance throughout your home...Beautiful tablecloth..and I am sure the hydrangea is thankful that you came to its rescue! So pretty! I love your white ruffles on both the table and in the bath. Where do you get your beautiful fabric? Courtney~~ You are so very talented and your home is so gorgeous. I love the shower curtain. It is romantic and beautiful.Thanks for always inspiring me. I love all the ruffles, and your bathroom makeover fabulous! Everything is sooo beautiful. Gorgeous tablecloth! I love white linens but in my home I would have to wash them twice a day just to keep them looking that clean and crisp. I love crisp white linens with ruffles as well and you have some amazing ones!! Thanks for sharing with us. Oh my gosh....I'm in ruffle heaven, Courtney! It's all so beautiful! What type of white cotton did you use? Just regular ol' cotton...? Or something special? I AM IN LOVE WITH THIS TABLECLOTH!! 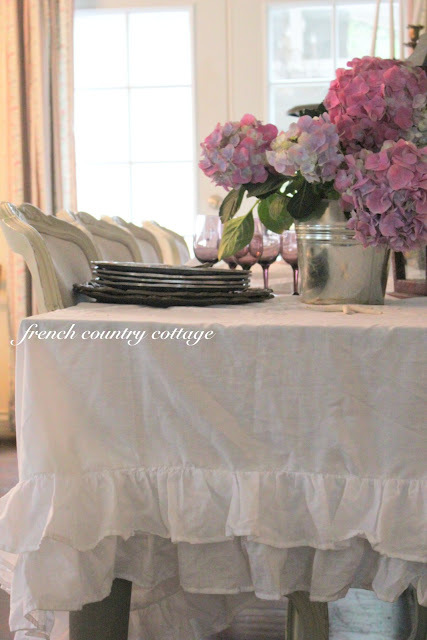 SO RUFFLY AND ROMANTIC..AND PAIRED WITH THE GORGEOUS HYDRANGEAS...IT IS LIKE A DREAM. COME LINK UP TO MY CENTERPIECE WEDNESDAY PARTY AND SHOW OFF YOUR IDEAS. I love anything with ruffles. Gorgeous! The ruffles make all the difference! Courtney, I don't know how you sew all those ruffles and still keep your sanity. They'd have to cart me off. Your tablecloth is just divine!! Thanks so much for linking up for the party! I love the grey chairs.. when did you paint them? Looks like I need to go through some old posts! You always blow me away with your mad sewing skills! Just gorgeous my friend! Beautiful! Love this look!~ Thank you for joining me at Home Sweet Home!